Aussie Natural Ceramic water dispensers keep the water at just below room temperature. They are lead free and great for taking away on holidays, no power needed. 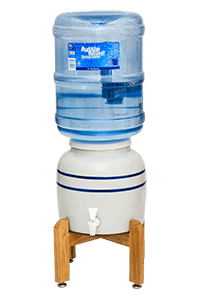 Sometimes you don’t always have a power source available for your water dispensers, or you’re looking for a more compact, traditional design of water dispensers for your home or office. Our Aussie Natural ceramic water dispensers are lead free, and keep your water at just below room temperature, for a gently chilled and great tasting drink, or cooled to suit your other requirements. The ceramic bottled water dispensers are also designed to naturally keep the water chilled, without any plugs or recharging- perfect for taking away on holiday or camping. Don’t go on holiday, only to get stuck with that bottle of water that’s been heating for three days in the glovebox- simply remember to bring your ceramic water dispenser and bottled Aussie Natural Spring Water, so you, your friends, and your family can enjoy pure water at a refreshing temperature, right throughout those summer getaways. Our ceramic water dispensers will complement any home or office, with our simple, authentic ceramic finish to add a touch of elegance to your water cooling system.